Anthony Kim, CEO of Education Elements. No gymnasiums, no cafeterias and no administrators. That’s school policy at AltSchools, a chain of private, for-profit schools backed by the likes of Andreessen Horowitz and Mark Zuckerberg. At the location I visited, the school schedule was written on a white board and could be changed in real time. Students flowed between grade levels and classes based upon what they wanted and needed from teachers. To me, it seemed a bit like a 21st-century version of a one-room frontier schoolhouse. But no matter — AltSchools “has been anointed by the top minds in Silicon Valley as the best hope for the future of education,” according to WIRED. The reason why is AltSchools’ use of technology. Instead of textbooks, students in AltSchools’ mixed-grade classrooms work through “lesson playlists” on iPads or Chromebooks that are tailored to their proficiency level and learning style. Teachers supplement tech time with group or individual instruction, an approach known as blended learning. My visit got me thinking — how would one of our school districts, which might contain 100,000 or more students, implement AltSchools’ model? Would they need to build small schools on every corner, until they were as ubiquitous as Starbucks? Based on my experience, the biggest barrier to rolling out an AltSchools model more broadly would probably be the district itself. I’ve found that districts’ layers of complex and siloed workflows and vast systems of checks and balances often get in the way of implementing personalized learning through edtech, especially when technology changes so fast. Before we revolutionize the classroom or the school, we need to revolutionize the school district. Seventy-five to 80 percent. That’s the percentage of high school students who graduated with diplomas in the United States in 2010 — and in 1990. In other words, in the past two decades, graduation rates have barely budged. That’s not entirely a bad thing. The U.S. educational system was founded on a system of factory-floor efficiency, governed by ringing bells, classrooms specialized by subject and students organized by age. And it’s clear that this system has more or less delivered on its promise of getting a majority of kids the basic math, reading and writing skills they need to face the challenges of the 20th century. The 21st century, however, is a different matter. In the workplace of the 21st century, what you know is still important, but what you can learn is just as vital a metric for success. Today’s globalized economy increasingly rewards creativity, out-of-the-box thinking and collaboration. Skills like this aren’t captured by the high school graduation rate, scores on knowledge-based assessments or any of our other standard metrics of education “success.” And none of them are the type of skill one learns in a factory, either. Unfortunately, factories are what school districts are still set up to administer. 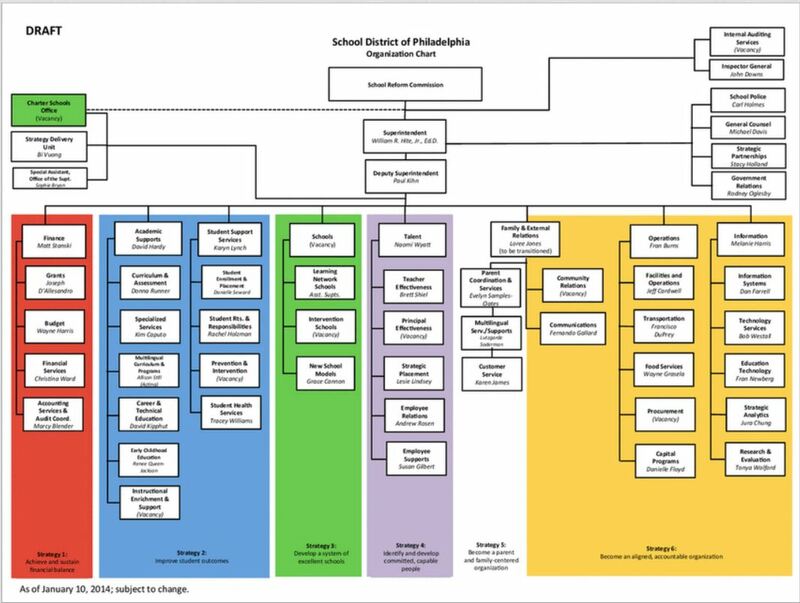 Take a look at an average school district’s organizational chart, like this one from the school district of Philadelphia. Sectioned into dozens of departments connected by a spiderweb of lines, it’s difficult for an outsider to decipher — and not too different from the charts of old-school industrial corporations like General Motors. Organizations structured like this often take a top-down, “control” approach to management, based on the Six Sigma model of process improvement. But as I wrote in my 2015 book Personalized Learning Playbook, that is a huge missed opportunity. In an age where not only startups, but established companies, employ increasingly flat management styles, we can do better in managing districts. Here are three steps to bringing school districts into the 21st century. We Need To Rethink How Districts Are Organized. Just as at a tech startup, management structures for a school district shouldn’t be one size fits all. Instead of being segmented by geographic attendance zones, for instance, a school district could be organized around student needs, with each department focused on a different learning style or skill set. The point isn’t that one structure is better than another — the point is that districts, like startups or charter schools, should be free to experiment to find the one that’s right for them. For districts just getting started, implementing the Baldridge Excellence Framework can be a great first step. This system, used by organizations like Ritz-Carlton Hotels and Boeing, focuses less on micro-managing process and more on providing support for reaching high-level goals. We have seen it work in districts like Horry County Schools, South Carolina, which, despite its size, has been able to get a lot done. Districts Must Recognize That Their Culture Has A Trickle-Down Effect. Personalized learning requires a fluid classroom environment, where students work at a pace individual to them, circulating freely between individual workstations and teams. A responsive district administration must be comfortable with this fluidity — and the best way to do that is to become more fluid themselves. Instead of using their resources to control staff or teachers, they must focus their energy on transferring knowledge to schools, providing contextual information and a big-picture strategy that schools wouldn’t regularly get from the local site. This, in turn, empowers teachers to apply a Design Thinking approach to their classroom environment, and to iterate and experiment with new approaches to learning. Districts Must Invest Time — And Encourage Schools To Invest Time — In The Initiatives They Promote. One-third of the time at each of the district’s schools will be spent in planning, professional communities and task force meetings. Yes, that’s right — one-third of the time. Teachers and administrators can’t respond flexibly to student needs without spending time each day sharing best practices for meeting them. If those three steps seem extreme, have no fear. We have seen Education Elements clients implement successful personalized learning initiatives on a district level without remaking their organization from the ground up. In the Enlarged City School District of Middletown, NY, for instance, classrooms participating in a stepwise blended learning rollout outperformed traditional classrooms by an average of 18 percent in reading and 7 percent in math in spring 2015. All of the district’s math and reading classrooms will be fully blended as the rollout completes in the 2015-2016 school year. We’ve also aided in successful rollouts in Warren Township in Indiana, winner of a $28.6 million district Race to the Top grant in 2012, and Fulton County in Georgia, one of the largest school districts in the country. But even these exceptional districts needed help. If personalized learning is to become the dominant paradigm for education in the U.S., more school districts are going to need to follow their path independently, via broader cultural change. The future of education — and of the personalized learning model — depends on it. With contribution by Poornima Apte and Aiyana Mourtos of Hippo Reads.